For this dining area, Extreme Measures Construction installed a polished overlay and then enhanced it with dye and decorative sawcuts. A polished concrete overlay installed by Concrete Polishing & Sealing Ltd. completely restored this 3,000-square-foot recreation room floor, giving it a high-gloss finish that reflects the overhead lighting. Madstone Concrete installed a self-leveling polished overlay to replace a failing wood floor and give the homeowners the sleek, modern look they were after. The overlay also allowed the homeowners to match the color of the floor to a Benjamin Moore paint color. It’s important to be ready for any contingency that may occur while placing a polished concrete overlay by keeping an organized mix station and plenty of backup tools and staff on hand. From surface preparation through grinding, honing and polishing, this video provides an overview of the process of polishing overlays. 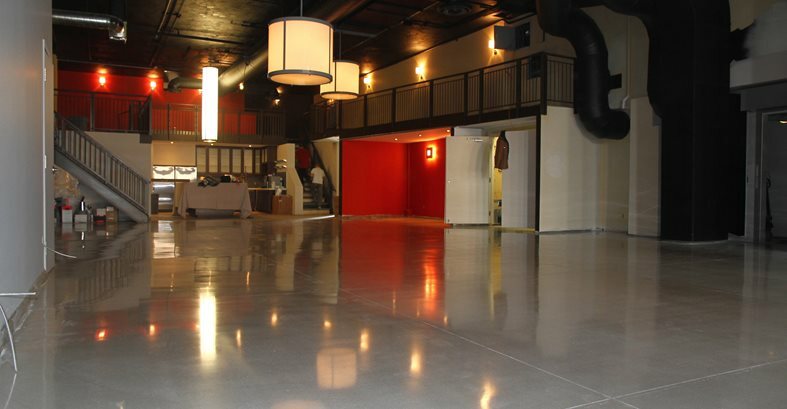 With their ease of maintenance and beautiful high-gloss finish, polished concrete floors are becoming the new superstars of the decorative flooring world, especially in high-profile retail and commercial settings. Although most existing concrete slabs can be polished, some have major flaws, such as spalled areas, carpet tack holes and extensive patchwork, which would still show through after polishing. And in terms of decorative options, existing polished floors are limited to the application of topical color. To meet the demand for an aesthetically pleasing solution for polishing imperfect concrete floors, more and more contractors are now installing polished overlays as an economical alternative. The Concrete Network talked with three contractors who specialize in these projects to get their viewpoints about the applications for polished overlays and how to achieve success in this growing market. Why floor owners like polished overlaysIn most cases, polished overlays are used to cover up problem floors and achieve a perfectly smooth, seam-free surface. In other cases, the owner wants to enhance an existing floor with decorative sawcuts or get a terrazzo-like finish by seeding the overlay with colored aggregate. “A polishable overlay will let us provide the polished concrete look for a client but without the underlying slab imperfections showing through,” says Brian Johnson, owner of Extreme Measures Construction, Beaumont, Calif., a company that installs polished overlays, microtoppings and stampable overlays. One of their specialties is to seed the overlay and then polish it to expose the aggregate. He says this process can be offered as a terrazzo alternative at about half the price. Tom Zilian of Madstone LLC, Barrington, R.I., installs polished overlays for both commercial and residential clients. “The demand is growing as awareness grows, especially in the residential and small high-end commercial markets,” he says. His clients include image-based businesses who are trying to portray an ultramodern, minimalist design aesthetic and homeowners who like polished overlays because they can be custom matched to a desired color and offer a seamless, low-maintenance surface. “Most importantly, polished overlays are a good solution when the existing concrete is in such poor condition (cracks, spalling, pitted, out of level) that polishing the existing concrete would look undesirable and too industrial,” he says. Installation considerationsInstalling a polished overlay requires a different level of expertise than when simply polishing an existing concrete floor. Preparing the floor for the overlay is often the most time-consuming aspect of the process, especially if existing floor coverings must be removed and the underlying floor needs to be reprofiled. Semakov often uses a 10-inch sandblaster and industrial floor grinder to remove residual tile mastic and unsound concrete and leave behind a roughened surface profile. Placing the overlay itself can also be tricky. It’s not for the faint of heart or those inexperienced with the process, according to Johnson. “Timing is critical on so many parts of this process, such as getting the mix on the floor, seeding the mix at the right time, sawcutting [if desired], and finally polishing the floor and applying dyes and the densifier,” he explains. 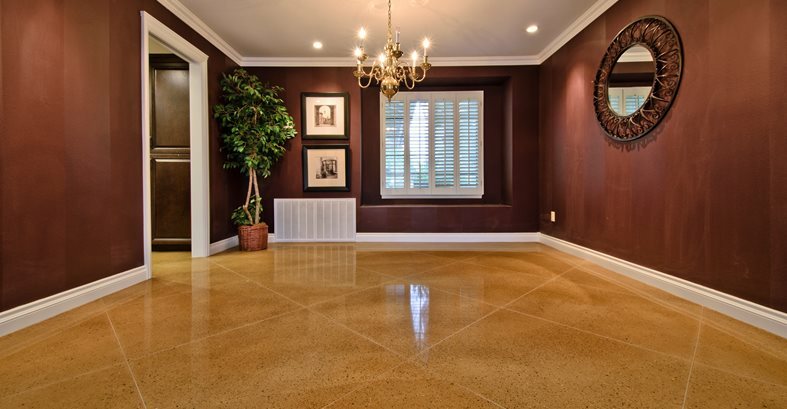 Once the overlay is down, however, the polishing process is fairly straightforward and can be accomplished with standard concrete polishing equipment. “For overlays, we use the same method as when polishing normal concrete, the same diamond tooling,” says Semakov. Zilian advises contractors to always use a planetary grinder when polishing concrete overlays and begin polishing no later than 24 hours after overlay placement. Going beyond basic polished concreteAlthough it takes time and diligence to perfect the installation of polished overlays, it’s worth the effort. “It’s only a five-step process, and it reveals a rich, deep shine,” says Zilian about his company’s method. He also notes that polished overlays offer distinct qualities that can’t be achieved by polishing existing concrete, such as the ability to create a white polished concrete floor and even distribution of exposed aggregate. Semakov says that his clients are looking for flooring options beyond basic polished concrete. “At first, our company undertook straightforward projects, like polishing concrete floors for IKEA, which required only diamond polishing and densification. As the market has matured over the years and the industry has gained more experience, the demand has grown for more complicated and aesthetically appealing solutions, including the installation of polished microtoppings as well as the use of dyes, water-based colors, and various lithium and water-based coatings,” he says.